"So Moses led the Israelites out of Egypt. They had been there for 430 years. They were finally free and going to God's Promised Land." This story is presented in short sentences, large print, and brief passages of text on each page. The detailed illustrations highlight each story and provide context clues for early readers. There is a special section in the back featuring "People in Bible Times" and "Words to Treasure" with Scripture references. 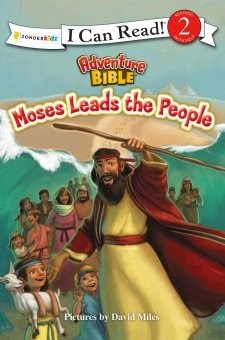 Moses Leads the People is a faithful retelling of these biblical events, and kids who are familiar with The Adventure Bible will enjoy the format of this book. My early reader is excited about reading Bible stories independently. I appreciate the careful attention to detail in this book, as well as the way the harsher details are presented in a gentle way, so even young children will enjoy this book as a read aloud. "Moses and Aaron met with Paroah. the king of Egypt, asked Moses. 'Please let the Israelites go,' said Moses. to use. They would convince Pharoah." Not only is Moses Leads the People a wonderful way to introduce Bible events to children, but it is also a nice way to practice reading skills and engage kids with a fun format. Definitely a valuable addition to our shelves!